The vibrant, historic and cosmopolitan metropolis of Köln, in North-Rhine Westphalia, is visited by thousands of people during the course of any given year, tourists who mainly come to experience the city’s culture and traditions, the focal point of which is surely the stunning Gothic architecture of the twin-spired, Kölner Dom, Germany’s most visited landmark. But just for the record, KW14 2019 brought a couple of prominent VIPs to the city, albeit on different days, that I thought was a bit of an unusual fluke. I mean, not only was Kiefer Sutherland, who plays Tom Kirkman, a fictional POTUS character in the hugely successful TV series, “Designated Survivor” in town for a concert at the Stadtgarten on April 2 but, the former POTUS for real, Barack Obama, was also in town to attend the World Leadership Summit at the city’s Lanxess Arena two days later on April 4. I’m not sure if there are any odds for a coincidence like this happening but in any case, the reason I was in town was to see the leading man who portrays the fictitious version of the POTUS performing a concert that had been advertised as: an intimate night with KIEFER SUTHERLAND. Oh yes, please was the thought that crossed my mind when I first saw this extra special tour announcement although I have to say, the bit about there only being 150 tickets available for the Köln venue made me a little nervous especially as I am apparently still on Ticketmaster’s waiting list for Springsteen on Broadway and yeah, that episode ended last December without so much as a text to tell me I wasn’t one of the chosen few to get a special access code! Naa-jaa… so I showed a little faith, thought positive thoughts and for this performance at least, the proverbial toast landed jam-side up. The stage in the Stadtgarten venue was set up like a living room that presented a very warm and welcoming ambiance indeed. Besides the rug on the floor and some table as well as standard lamps that created a soft-lighting effect, an antique barley-twist dining chair together with a small, matching occasional table that had just enough space underneath it to park a flat-brimmed cowboy hat safely, had been positioned stage centre; a brown leather Chesterfield-style wingback chair had been placed slightly behind, acting as the meat in the sandwich between a drum kit and an upright double bass; a keyboard area had been set up stage left and stage right presented a collection of acoustic and electric guitars seemingly ready and waiting for some action. So yes, it has to be said that all of the above equipment suggested that maybe Kiefer Sutherland would not be performing entirely solo. 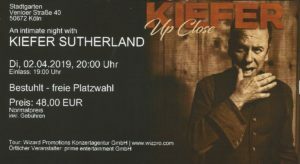 At 20:00 on the dot, Kiefer walked towards centre-stage, raised the whisky glass in his hand to toast the audience with a, “Prost!”, sat down and began to perform a haunting, solo acoustic version of, Calling Out Your Name, a track that appears on his critically acclaimed 2016 CD release, Down In A Hole. Actually, I was more than a little bit bedazzled by the whole situation from my fifth row, centre seat and yes, my thoughts drifted back to another time when I saw Kiefer Sutherland sitting on a chair similar to this… OK, maybe the chair wasn’t as grand in terms of antique value, but the scene that flashed through my mind was the one where the artist who was performing so passionately and only a few metres in front of me, was bound, gagged, stripped to the waist, had a couple of very scary-looking electrodes attached to strategic – and I would imagine – sensitive areas of his upper torso, apparently on the receiving end of what the script writers of “24” wanted us to believe was a brutal and torturous interrogation act on CTU Federal Agent, Jack Bauer. I’m very happy to say that the only obvious sign of electrical power on this occasion, was the “jack cable” that was plugged into Kiefer’s Gibson guitar! So, one performer became two, two became three, three became five and with that, the whole band was soon on stage with Kiefer, raising the on-and-off-stage pulse levels further. The band – as tight and in-synch as I have ever seen a band perform – played a total of eight tracks from the Down In A Hole CD (Shirley Jean, Can’t Stay Away, Truth In Your Eyes, Not Enough Whiskey, I’ll Do Anything, All She Wrote and Down In A Hole), nine tracks from the soon-to-be-released, Reckless and Me (Open Road, Song For A Daughter, Something You Love, Reckless And Me, Faded Pair Of Blue Jeans, Blame It On Your Heart, Saskatchewan, This Is How It’s Done and Agave), two covers, Tom Petty’s, Honey Bee and Bob Dylan’s, Knocking On Heaven’s Door plus one more original, but-as-yet-unrecorded-song, Rebel Wind. Each song was preceded with an informative introduction and it truly was a fascinating experience listening to Kiefer’s heartfelt stories. He spoke very candidly about the inspiration behind his song-writing, the people he dedicated the songs to, his feelings and narratives about his closest family members, his friends, his friends who have passed, his childhood memories… altogether, it was a wonderful mixx of humourous as well as melancholy anecdotes that gave us a little peek into the life of the person who was holding court in this small and cosy auditorium in Köln, the same city Kiefer called “home” for a spell, several years ago. 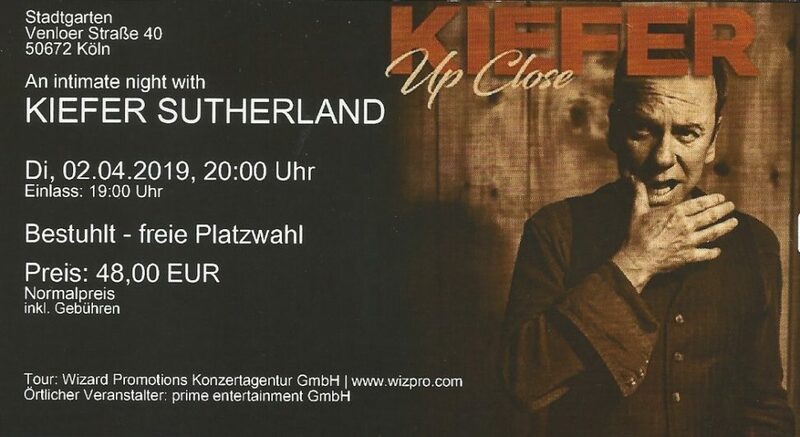 I was lucky enough to catch one of Kiefer’s concerts last summer during his, Not Enough Whiskey Tour (KS Management’s choice of spelling, not mine!) and one of the melodies from that show came home with me. I’m delighted to say this track is on the new CD, Reckless and Me and is called, Something You Love – I just love the way it is described as ‘…a propulsive where Petty-meets-Springsteen rocker…’ on Kiefer’s website. Yep, I would agree wholeheartedly with that description and “Reckless”, in case you are wondering, was the name of Kiefer’s horse when he was riding in rodeos for a living…. just one of the super-interesting snippets of insight Kiefer shared with us. When the main part of the set was completed, the band left the stage and Kiefer stayed behind to host a “hang out” session with the audience. I had had a bit of a heads up about there being a Q&A part to the evening and prepared myself accordingly in the hope that I might get lucky. It’s a little bit difficult to describe the feeling of ‘role reversal’ when I found myself standing only a few meters away from, and interacting with, someone whose acting skills have filled my living room for, it has to be said, many an hour… and suddenly, it was the other way round with me feeling like I was in Kiefer’s living room! M: Some people say there is a particular song that provides a “soundtrack to their lives”… is there a song out there that does that for you? And at this point, the rest of Kiefer’s response was lost in the volume of audience appreciation at his genuine expression and reaction to this spontaneous recollection of a wonderful memory from his past. Kiefer responded to a total of five questions chosen at random from the audience so yes, I consider myself to have been extremely lucky to have had a chance like this. When the Q&A session was over, the band came back on, blasted their way through two more songs ending this ab-fab evening on a high with, Knocking On Heaven’s Door. Kiefer told us that this song featured on a tape his dad (…ummm… that would be, Donald Sutherland…) used to play in an 8-track system he had in his Ferrari as in: the Ferrari Mr Sutherland, Senior drove when doing Kiefer and his sister’s school-run – part of this tale also had Kiefer reflecting on the total lack of approved child-safety equipment required in cars back then! All too soon, the final notes faded and drifted off somewhere over our heads… and with that, our intimate evening with Kiefer Sutherland had come to an end. I’ll admit to having come into this scene with Jack Bauer and Tom Kirkman as my tour guides, as it were, but have very definitely come out with Kiefer Sutherland leading the way. If you get a chance to catch Kiefer on the road, absolutely take it… he’s an incredibly accomplished singer/songwriter/musician presenting his material in what he described earlier in the evening as, “a traditional country music style” with a band of excellent, multi-talented and dedicated musicians supporting him. Kiefer is also a fabulously charismatic storyteller and of course, there is the added bonus of seeing another side to his outstandingly successful and extensive acting career, up close. Did the evening live up to my expectations? I really wasn’t sure what to expect if I’m honest, but I was more than happy to take the train as well as my chances and go with the flow. So yes, I can now say with conviction that I loved every single second of it. Thank you so much to Kiefer, his Management and Road Crew for bringing this incredibly special experience to Köln… chances like this don’t come along very often and I, for one, am very grateful to have had this extraordinary and very special opportunity. It was a superb evening, full of magical moments and until the next time I have a chance to see another live performance, I’m raising my glass to the release and success of Kiefer Sutherland’s new CD, Reckless and Me available in all formats and from all outlets on 26 April 2019.